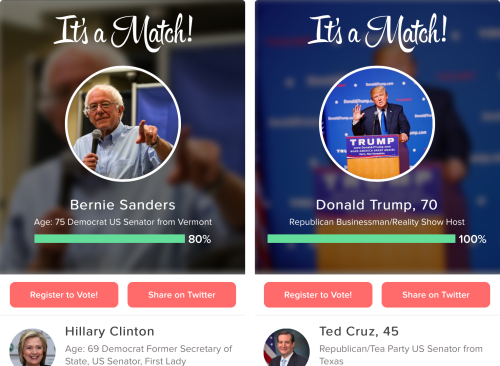 When it comes to politics, Tinder isn't really an app that you're likely to think of, but that’s about to change. A while back some users started using Tinder to campaign for Democratic candidate Bernie Sanders. The users who did so got in trouble but it seems to have made Tinder realise that there is in fact room for politics. Swipe the Vote has been popping up as a video card for Tinder users since yesterday. Whilst swiping through your potential matches it'll show you an image asking you to take a poll. Once you click yes then it'll show you ten issues and you just have to swipe right if you agree and swipe left if you disagree on it. If you click on the issue then you can get more information it if you need it. Once you've gone through all the issues then it'll match you up with who you should vote for based on your answers. It'll also give you a percentage of how closely your views match the candidates. If you feel your percentage wasn’t high enough or you wanted more information, then you could always use Voter to get a more detailed and personalised result. 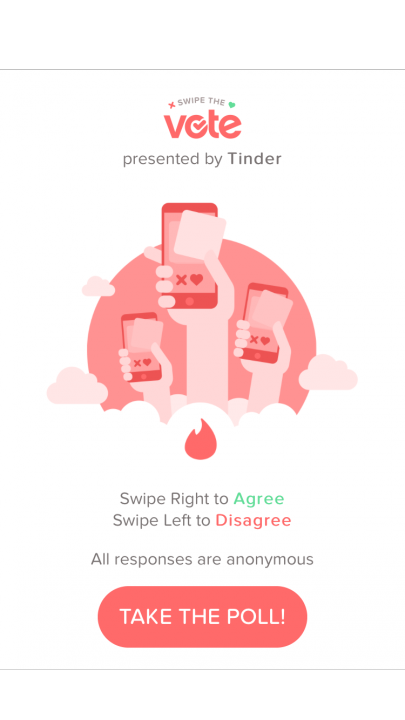 This feature was built using a polling platform called Wedgies and the information was pulled from the previously mentioned Tinder like voting app called Voter. This little feature is basically a miniature version of the app that has been opened up to millions of more users across America. Plus considering this feature is on a worldwide app like Tinder, it could also be utilised during other countries elections to help more people decide how to vote. If you do the quiz on Tinder then once you have your results then you'll have the option to share it with people and register to vote if you haven't already. This makes the process more streamlined and could help encourage more people to go out there and vote as registering is easy. With Tinder slowly being used less and less as a dating or hook up app it makes sense that they need to find more uses for it. This feature was a step in the right direction and shows what good Tinder can do if it ever moves away from the dating game.